Analysis into the oil industry oil has found that prices have reached record highs and record lows over the past 15 years. Data illustrated by the graph shows the price increase from 2003 – 2006 was more gradual, before escalating into a steeper climb leading to a record high of around $145 in 2008. Industry experts attribute the sudden price drops in 2008 to President Bush after lifting the ban of oil drilling and the Lehamn brothers (the global finance system) declaring bankruptcy resulting in the lowest point of $32 per barrel by the end of the year. Now, in 2015 after falling roughly 60% from last June, we have seen the price of oil fluctuate by an average of 3% for 14 days throughout the month of January. With the volitility of the current market, the majority of experts refuse to predict future oil prices. Figures show Britain’s economy is on track for its strongest growth in nearly a decade. The GDP shows a rise of 2.9%, which is the fastest since 2006. The fuel is down which will hopefully push consumers into spending whilst its low within 2015, some have even stated that it could push percentages of consumer spending upto 3.5%. Tom Pugh, analyst at Capital Economics, suggests that the industry is in for more turmoil before finding a steady point of $60 a barrel by the end of 2015. 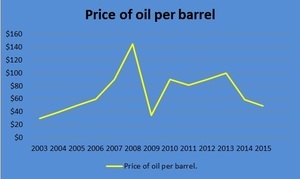 We can then expect oil prices to rise again in 2020 upto £70 a barrel, however that doesn’t mean it’s a clear route there. We can only hope that one of the biggest providers of energy stay consistent for the forseeable future but to secure yourself the best deal on your energy, why not use our price comparison service?